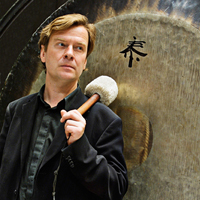 Magnus Lindberg is one of the internationally best known Finnish composers of his generation. Lindberg is predominantly a composer of instrumental music, above all orchestral music. His musical language is usually highly complex yet highly full of vim and verve. Lindberg is both rationalist and pragmatist, a hands-on musician - a pianist - who participated in many premieres in the early stages of his career and founded the experimental Toimii Ensemble. Lindberg studied composition at the Sibelius Academy with Einojuhani Rautavaara and Paavo Heininen (graduated 1981) and later in composition masterclasses with Franco Donatoni, Helmut Lachenmann and Brian Ferneyhough. In the early 1980s, Lindberg moved to Paris for several years, studying privately with Gérard Grisey, the developer of spectral music, and Vinko Globokar, whose interests lay in the social functions of performing and in improvisation in contemporary music. IRCAM and the impressive figure of Pierre Boulez contributed significantly to Lindberg's mental landscape. Among the many prizes he and his music have won are the UNESCO Rostrum in 1982 for ...de Tartuffe, je crois and in 1986 for KRAFT, the Prix Italia 1986, the Nordic Music Prize 1988 for KRAFT, the Royal Philharmonic Society Prize for large-scale composition in 1992 and the Wihuri Sibelius Prize 2003. Serving as Composer-in-Residence with the New York Philharmonic from 2009-2011, Magnus Lindberg is also much in demand as a teacher of composition masterclasses.